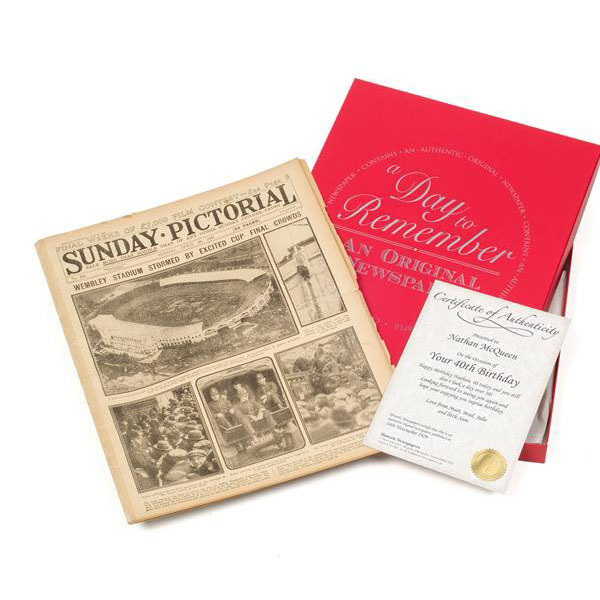 This fantastic gift gives you a genuine newspaper (not a copy) from the wedding day and is sure to become a cherished and nostalgic gift for a couple celebrating their Diamond Wedding Anniversary. 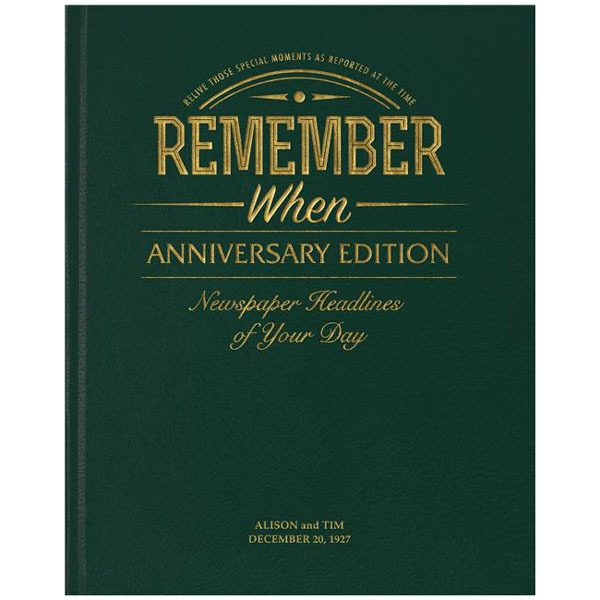 The Diamond Anniversary Original Newspaper Year Book makes a great gift. 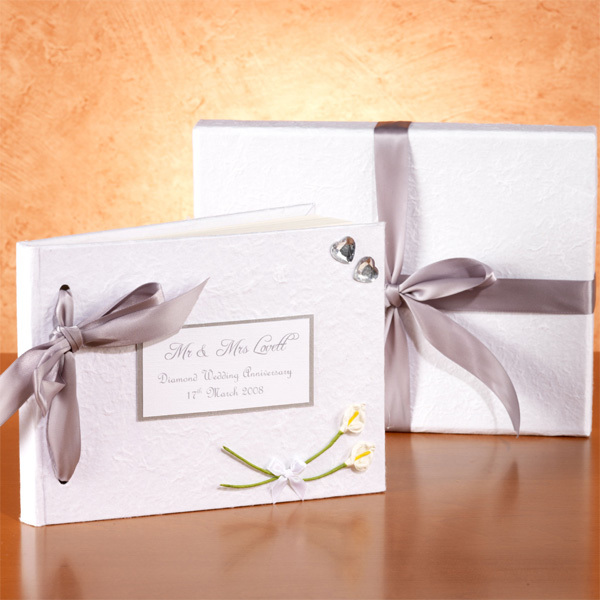 Relive news and major events of a selected date, with this beautiful handmade leatherette book. A diamond anniversary truely is something to celebrate and this gorgeous handmade album makes the perfect gift. Fill it with photos from over the years and the happy couple will certainly have a smile on their face when they look through it. 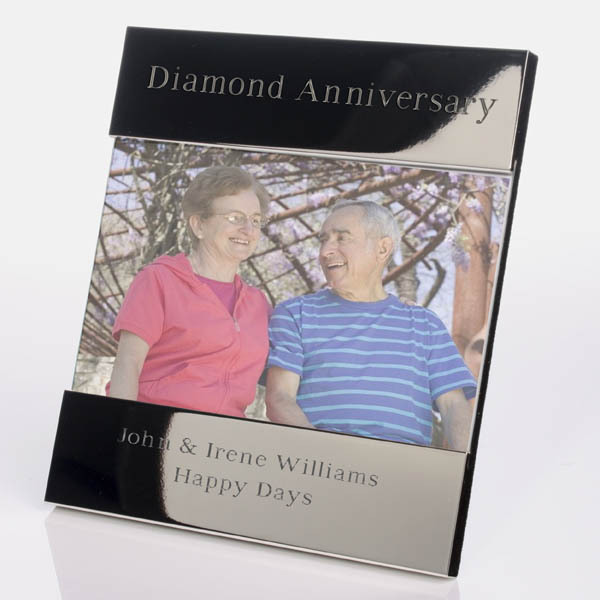 Personalised with an engraved message this silver-plated photo frame makes a stunning and unique gift idea for a couple celebrating their Diamond Wedding Anniversary. 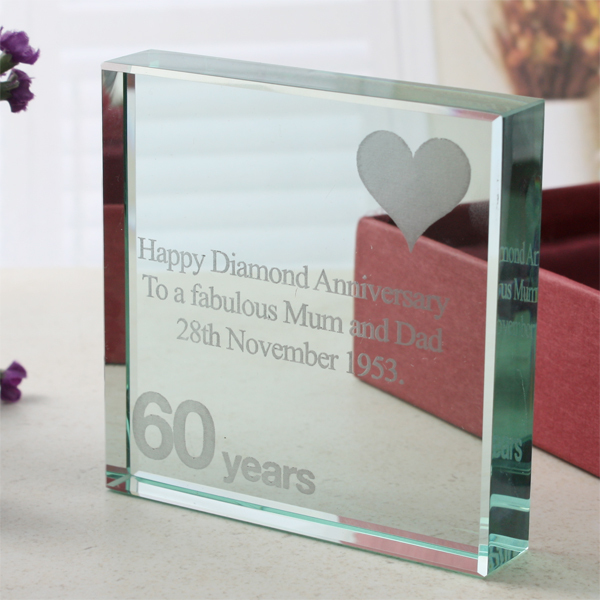 This fantastic Diamond anniversary glass keepsake is engraved with a personal message and makes a lovely gift for a happy couple celebrating 60 years of marriage. A truly special memento of a 60th Wedding Anniversary. A chronical of the couples wedding day giving facts about both partners as well as news and events for that very special day. 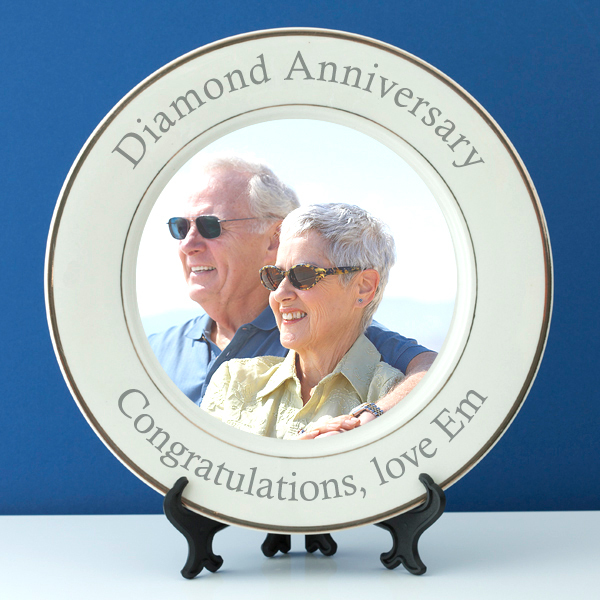 A special couple celebrating 60 years of marriage with this personalised Diamond Wedding Anniversary Photo Plate. The plate is personalised with a photo and message of your choice. The Diamond wedding anniversary print comes in a wooden frame and features the couple's names, the year they got married to the present year and a large '60 Years'. 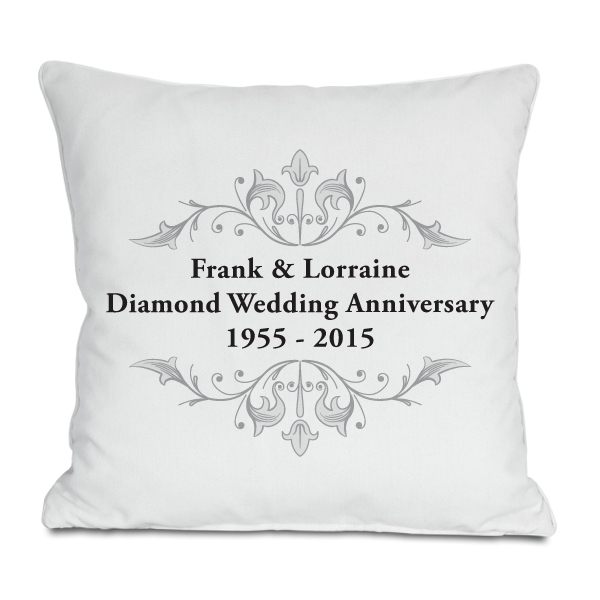 The Personalised Diamond Anniversary Cushion makes a great personalised gift for a couple celebrating 60 years of marriage. Personalised with name and anniversary date. 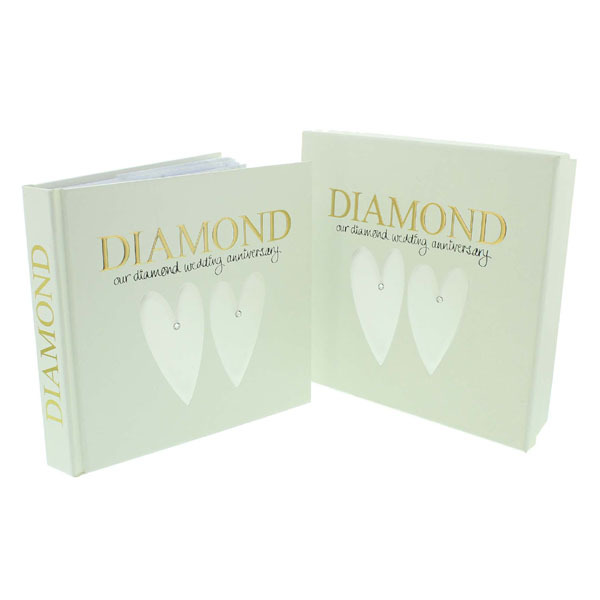 Part of the Wendy Jones-Blacket collection - this Diamond Anniversary Photo Album and Keepsake Box makes a wonderful gift for a couple celebrating 60 years of marriage. 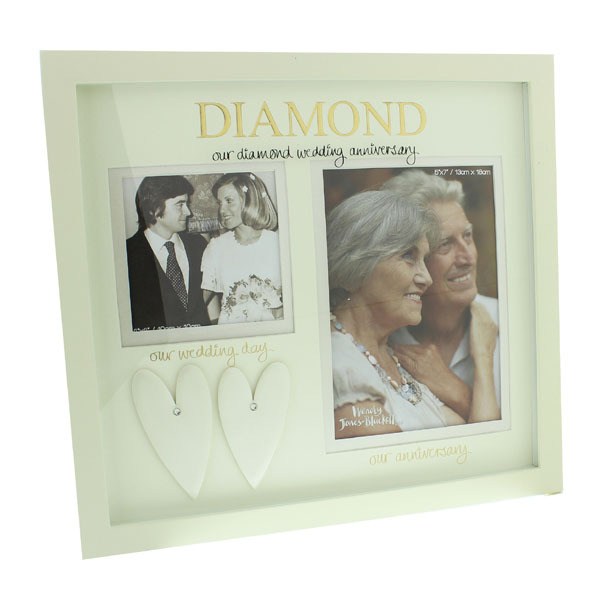 This lovely Diamond Anniversary Then and Now photo frame makes the perfect keepsake gift for a couple celebrating 60 years of marriage. With the two spaces for photos. 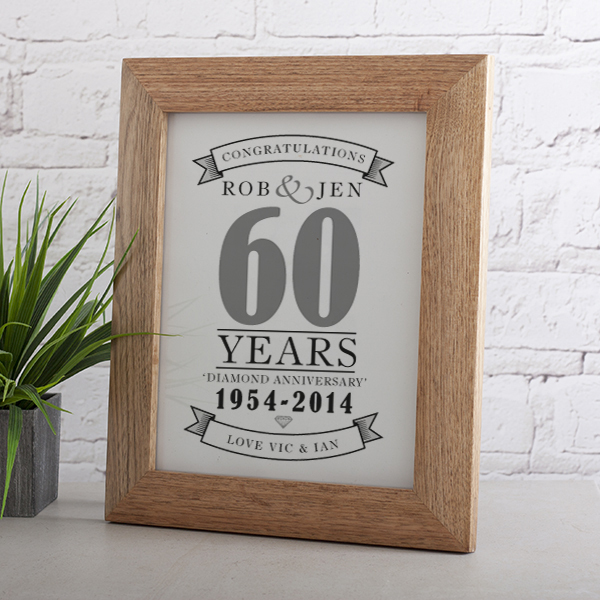 Celebrate 60 years of marriage with this Personalised Diamond Anniversary Shiny Silver Photo Frame.The frame is personalised at the bottom with a name or special message of your choice. 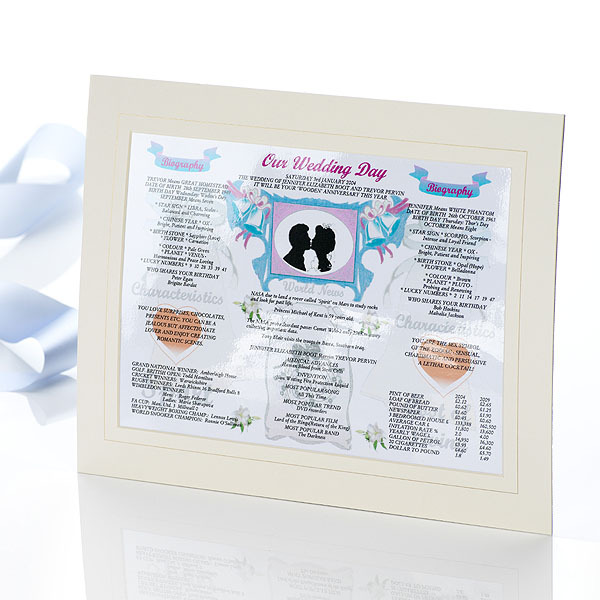 The top of the frame is engraved with the words 'Diamond Anniversary'The frame has a black felt backing with an easel style stand and is presented in a landscape format. Why not add an image to the frame to make an even more personal gift. Personalise with 2 lines of text each with a maximum of 25 characters per line.The frame holds a 6 x 4 inch photograph approx. This Lismore Diamond Anniversary Vase 35cm from Waterford is the perfect addition to any home. The Lismore Diamond pattern is a strikingly modern reinvention of the Waterford classic; characterized by intricate diamond cuts rendered in radiant fine crystal. This stunning Diamond Vodka Set in Chill Bowl with Silver Insert and 6 shot glasses makes such a stunning addition to any bar collection; with a radiance that showcases chilled vodka perfectly. The Lismore Diamond pattern is a strikingly modern reinvention of the Waterford classic; characterized by intricate diamond cuts rendered in radiant fine crystal. Perfect for displaying a floral bouquet, or two dozen roses, this Lismore Diamond 35cm Vase showcases its contents beautifully; and features the weight and clarity for which Waterford has become world famous. Bubbling over the edge of our champagne print card, this striking statement of spray carnations and frothy lisianthus is hand picked and arranged to order. Spoil them on this once in a lifetime day celebrating 60 years of marriage. \"Happy Diamond Wedding Anniversary\" will be printed on the card as well as your personal message. Our Diamond Wedding Anniversary gift suggestions have all been researched and carefully chosen by couples who have celebrated their 60th wedding anniversary, so you can be sure that the gift ideas we present will be things that they are likely to really appreciate. Of course, not every couple have exactly the same tastes, so we asked our Gift Gofers to select a variety of presents of different types and at various prices. If you don't see a present on this page you think your recipients would love to receive as a Silver Wedding Anniversary gift, use our Search option at the top of the page to tell us more about them: their hobbies and interests, and the approximate amount you want to spend, and the Gift Gofers will scamper off to their database and find you some more great presents to suggest for you.